Last week I attended the National Order of the Arrow Conference (NOAC) at Michigan State University with my two youngest sons. The Order of the Arrow is a service subdivision of the Boy Scouts, known as Scouting's national honor society. The organization's largest event, NOAC is held about every three or four years. This NOAC was special, because it represented the centennial celebration of the founding of the OA. What started as a little program to honor campers at one Scout summer camp has expanded into an organization with about 165,000 members. 15,000 of those members were at MSU last week. The only reason there weren't a few thousand more in attendance was that there was simply no way that the venue could host more people and there was little chance of getting another venue that could. I'm not big on attending conventions. I have arrived at a stage in life where large crowds aren't that appealing and where many large events are simply less personal extrapolations of smaller events. While larger events can take advantage of economies of scale, they almost always entail logistical drawbacks in exchange. Many people in my profession love going to information technology conferences. Me, not so much. Despite my dislike of large events, our family made a commitment and we started plunking down money more than a year ago for the boys and me to attend this function. The boys (especially Son #3) had a strong desire to attend. Son #3 had attended NOAC in 2012, which was also held at MSU. Until last week, that NOAC had been the largest OA event ever, with 8,000 attendees. Son #4 was new to the OA last year, but he had the idea that he would like to attend the event. We figured that it was likely a once in a lifetime opportunity for me to share an experience like this with the two boys. I had an idea of what NOAC was all about, having attended the 1979 NOAC at Colorado State University (4,351 attendees) and the 1986 NOAC at Central Michigan University (3,700 attendees). Of course, that was a long time ago and the crowd sizes were orders of magnitude smaller. By late autumn last year it became clear that there was far more interest in this NOAC than in past events. National asked lodges to limit the number of adult attendees so that more youth could attend. I squeaked by because I had two sons going, one of whom has special needs. After an entire year of coordination (mostly online, but bolstered with a number of in-person meetings), our lodge contingent of 49 people met at the airport early on a Saturday morning. After the obligatory waiting around, we flew to Detroit, where a chartered bus took us to a hotel. After getting settled in, the bus shuttled us to an Italian restaurant for dinner. Then it was back to the hotel for activities, swimming, relaxing, etc. On Sunday we attended church. The LDS members of the contingent visited the Dearborn Ward, which was a long way from our hotel. I loved the diversity and feeling of the Spirit in that ward. The remainder of the contingent attended a nondenominational service led by a lay pastor from our group. 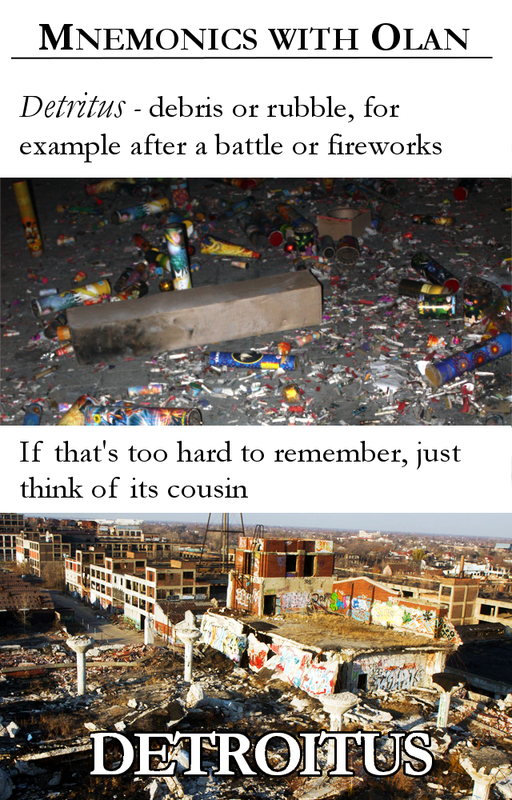 During our travels, the freeway we were on passed through the infamous Detroit slums. Even from the walled freeway, the blight of what looked like an endless demilitarized zone was unavoidably apparent. Very early Monday morning we were back on the bus, which took us to the east end of the MSU campus. The check in procedure seemed fairly well designed. We attended a couple of orientation events, had professional group photographs taken, and checked into our dorms. We ended up on the sixth floor of a large and seasoned dormitory that turned out to be a mile from most of the closest events. The large cafeteria served food that was ... well ... cafeteria food. Not terrible, but nothing to write home about. Oh well, somebody had to stay there. 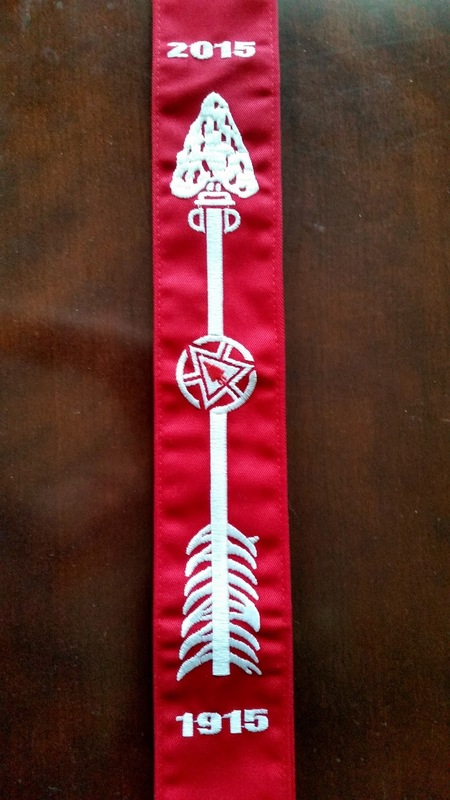 Each NOAC 2015 attendee was given a special centennial sash that has a white arrow with specialized devices (including NOAC 2015 token in the middle of the shaft) embroidered on a red background. 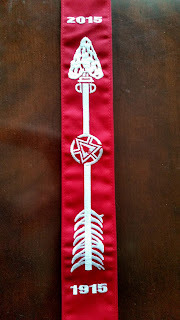 Given the limited run, the sash has already become collector item. Although we were all asked to wear our red sashes throughout the week, some attendees refrained from taking theirs out of their wrappers. More on collecting later. We spent Monday afternoon exploring campus and relaxing. We had arrived on campus before 8 am. Some groups were scheduled to arrive as late as 4 pm. So we counted our blessings. The conference began with an opening show at the jam-packed basketball arena on Monday night. In fact, the arena hosted big shows four nights of the conference. Unlike past conferences, everyone had assigned seats. This made getting into the arena much more pleasant. Before each show they had a pre-show that was very much like pre-game events. They played loud music. Some of it was accompanied with lyrics displayed on the jumbo-tron to encourage singing along. I was surprised at how many of the boys lustily sang along to Neil Diamond's 1969 hit Sweet Caroline. The song was released before many of these boys' parents were born. Boys also enthusiastically sang along with the 1975 Kiss song Rock and Roll All Nite, which likewise was released before some of these boys' parents entered this world. Although I grew up with these songs, I think that I had never really known what the lyrics said until I saw them scrolling down the big screen in the arena. The song that took the house down was Let It Go from Disney's Frozen. It was hilarious to see thousands of boys loudly singing this song that they wouldn't be caught dead singing at home in front of their little sisters. During each pre-show event they brought out this huge T-shirt flinging Gatling gun a couple of times. Each time they would shoot about 20 shirts into the audience. They also had single-shot T-shirt bazookas that fired T-shirts into the upper seats. Son #4 was one of the first ones to catch a T-shirt on Monday night. Then he complained at every subsequent show that they weren't shooting shirts into the area where we were sitting. By my count, he was one of fewer than 2% of attendees that got a shirt that way, so I told him to quit griping and be grateful. Most of the shows were very Scout and OA based. One night centered around the Distinguished Service Award. Another night focused on how the OA has positively impacted lives. Tuesday was the most entertaining night. The show opened with Charles Peachock, who has an amazing juggling act. Unfortunately, the night concluded a country music act that featured two sopranos that were great at singing third intervals. But they were loud, very high pitched, and every song sounded like a slight variation of the same thing. I can best describe it as grating. The final show on Friday night was my favorite. It featured a play about honoring the main principles and goals of Scouting even as the program morphs to fit the needs of a modern society. The story was about a Scout camp that was being modernized. Some characters felt that the plan destroyed too much valuable tradition. One character that was a wise old scoutmaster cautioned against making the trivial sacred while trivializing that which should be kept sacred. The main actor was our former lodge chief, who did an amazing job. In fact, all of the actors, both youth and adults, performed at professional levels. After the Friday night show they had a fancy light, indoor firework, laser, video, music, and confetti display that lasted about 15 minutes. It was a lot of fun. But it was also very loud. I had thankfully brought some earplugs with me. There were some things that I didn't like about the shows. The main thing was the talking. They sure had lots and lots of public speeches that went on and on. All of the presenters were pretty decent public speakers. But frankly, if you go more than three minutes in a large crowd of Boy Scouts, anything you say after that sounds like the teacher from Charlie Brown. It doesn't matter how good your message is, they won't hear it. And they certainly won't remember it. The first night the OA national vice chief spoke ... and spoke and spoke. I'm sure he's a great young man. And he is an accomplished public speaker. But, golly, he sure loves to hear himself talk. Mark my words, he'll be a professional politician someday. The national chief talked another night, but to me it seemed easier to listen to than the vice chief's talk. It was still too much. We also heard talks from BSA President Robert Gates (who has been a member of the OA since his youth) and BSA Chief Scout Executive Wayne Brock. A couple of other large events also featured more than sufficient lecture. Many said that there was far less talking and more informing through entertaining theatrical events at the 2012 NOAC. I tried to imagine the planning for the 2015 event. In my mind's eye I could see someone at a meeting saying, "I attended NOAC in 2012 and we had way, way too much fun stuff at the shows. What we didn't have enough of was talking and lecture. Because everyone knows that Boy Scouts love to hear people talk ad nauseum." On Friday morning we had an event in the football stadium. While most logistical aspects of NOAC were exceptionally planned and executed, they dropped the ball on getting people into the stadium. We spent half an hour crowded in the stifling space under the stadium. Claustrophobics would have freaked out. The scent was awful. So much BO. When we finally got to our seats, they announced that we were going to listen to a talk. The audience forgot all about a Scout being courteous they loudly emitted a mass groan. Fortunately, the key speaker was Creek Stewart, Eagle Scout and host of the popular Weather Channel show Fat Guys in the Woods. He was brief and inspiring. I still am rather displeased about the national chief's #DareToDo initiative. The good part is that he asked every member of the OA to make a difference in the lives of others by committing to perform one act of unselfish service each day for the next 100 days. I wholeheartedly support this. But then he asked everyone to post each day about their service on social media using the #daretodo hashtag. I disagree with this part of the initiative and I won't do it. Posting on social media about the service you perform seems to run afoul of the Savior's admonition in Matthew 6:1-4. Those that do good works to impress others "have their reward" — a worldly reward. Jesus asked us to serve quietly, "and thy Father which seeth in secret shall reward thee openly." Maybe it would be good to post daily for 100 days about good acts you observe others carry out. Like any convention, NOAC offered a variety of classes, seminars, and activities. Participants had to sign up online for classes and certain activities weeks ahead of the conference. But there was also a plethora of formal and informal activities available — so many that there was no way an individual could participate in even half of them. A friend of mine worked with others from around the nation to put up a very good museum called the GEO (Goodman Edson Observatory). I was very impressed by the museum. The effort that went into putting it together for less than a week astounds me. Everyone I know that visited the GEO, both youth and adults, found it impressive and informative. A large city park, which was labeled The Hub for this event hosted hoards of outdoor activities and entertainment events. Some of these were under tents. Many were not. But the weather cooperated quite nicely throughout the week. One of the premier activities was the OA Warrior Challenge, which was a long and broad ranging obstacle course that covered most of a city park. Son #3 was interested in doing the challenge, but wasn't interested enough to wait in a line that was at least 45 minutes long. Despite his challenges, Son #4 did the challenge early one day when the line was short. Before long he was walking rather than running between stations. When he finally came across the finish line, he felt nauseous. Still, I was proud of him for finishing. A fellow from our lodge that is an art teacher ran a T-shirt silk screening activity all week long at The Hub. Anyone could bring a blank T-shirt (or hoodie, or neckerchief, or anything else) and get the conference slogan "It starts with us" screened onto it. Our contingent spent a number of hours volunteering at this activity. We screened as many as 16 T-shirts at a time and had a pretty good process going. There were indoor events around campus too. I spent a lot of time volunteering at the STEM (science, technology, engineering, math) lab. Given my career, I was supposed to work at the software development exhibit. But the exhibit failed to show up. So I was assigned to work at the interactive liquid nitrogen exhibit. The real stuff at the exhibit was handled by chemistry PhD candidates from the school. One of the other volunteers was a career PhD chemist. Although I was the odd man out, once I put on a lab coat and safety glasses, people treated me like a chemist. Amazing how that works. We had lots of fun and it was great to watch the boys (and even the adults) enjoy the activity. One of the major informal activities that occurred all over campus was patch trading. Most that are familiar with Scouting know that patch trading and collecting has a deep hold in the Scouting culture. Outsiders probably have difficulty understanding this mania. Heck, I have trouble understanding it, since I'm not much of a collector. But thousands of youth and adults at NOAC engaged in patch trading. There were trader blankets set up on patches of grass all over the place and most nights the large field house filled with traders. My two sons became deeply involved in the patch trading enthusiasm. Almost every night I had to drag them away and force them to return to the dormitory, getting us to bed way too late. Son #4 saw a patch he fancied, but he could find no one that would trade it away. Finally, he hunted down the dorm of the lodge the issued the patch. He camped out in the lobby, pestering passers by until he found a lodge member that would trade for the patch. And people don't just trade patches. They trade money. Some rare patches sell for hundreds of dollars — which to me seems like an astronomical price, given that they are coughing up big dough for pieces of embroidered cloth. 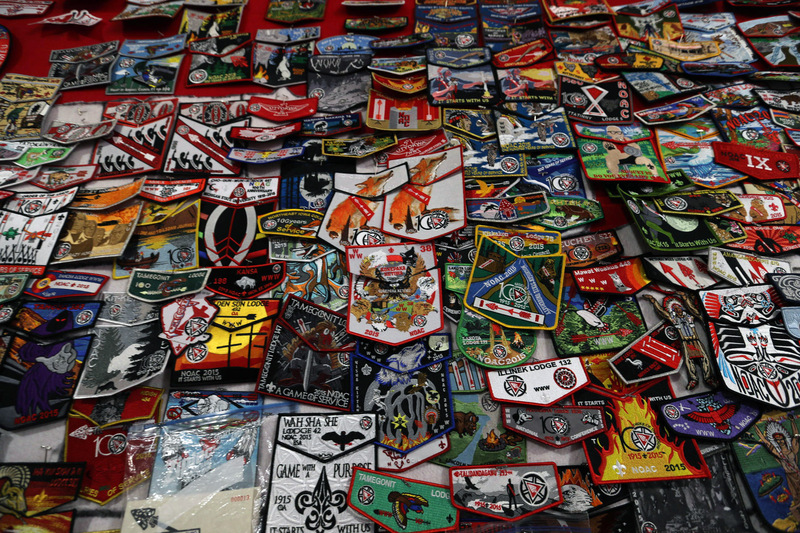 Ebay hosts a vibrant Scout patch trading market. There are even people that make their living at this. We had the misfortune of being housed in a dorm that was nearly two miles from most major activity centers. Conference organizers had arranged for buses to run in a continuous loop around campus. But even with all of the buses, it was sometimes quicker to walk than to wait. Plus there was plenty of walking to and from bus stops and at activities. Even with lots of bus riding, my phone tells me that I walked 7-10 miles every day that I was on campus. This is part of the logistical tradeoff of having a large number of conference attendees. One day I took my boys to the MSU Dairy Store, which was reputed to have very high quality ice cream. We waited in line 40 minutes to see if it lived up to its reputation. The selection seemed meager for someone that is used to choosing flavors at Farr's Ice Cream. The ice cream was good, but it certainly wasn't superior to stuff that can be readily obtained locally. The only thing that made it worth waiting in line was being in line with lots of other people with whom we could socialize. I take my hat off to the MSU staff that made the conference logistics work quite well. These people worked hard, mostly behind the scenes. MSU employees put in lots of extra hours. I felt sorry for the scoopers at the ice cream store, who worked very hard continuously throughout their shifts. On Thursday evening I overheard one cafeteria worker telling another that he had already put in 77 hours that week and that he still had to work on Friday and Saturday. The mostly volunteer NOAC staff also did yeoman's work in pulling off the conference. And they paid their own way to do so, arriving as much as a week before the first day of the conference. That's serious dedication. One of the main purposes of any conference is to connect with others. This time around, the OA employed PokenSPARK technology that has become quite popular at professional conferences. Each attendee completes an online profile, sharing as much data as they wish to share. Then each time they touch their SPARK to another, contact information is swapped as the devices light up. You can see contact info for everyone you "sparked" via a web page or via an app on your phone. And you get to take the device home with you. Not everybody got into sparking. But many did. I sparked with about a thousand people from all over the country. Indeed, from all over the world (since some attendees were U.S. citizens living abroad). But my rank was close to #5,000, meaning that about a third of the attendees sparked with more people than I did. I didn't put a lot of effort into it, but I willingly sparked with anyone that held up their device in my vicinity. The app also included an interactive campus map that helped with navigation. Very ingenious. On Friday afternoon I was helping at The Hub as they held a major celebration. Near our station was a stage where we saw several live bands play and other entertainers perform. I felt badly for the final band of the day. Crowds were dispersing and everyone was working to dismantle the place while the band played. No one sat and watched them, although, they were arguably the best musical act of the entire conference. Contingents had arrived in Michigan over a period of several days, some traveling by car or bus, and others traveling by air. But the staff worked to process everyone out over a 10-hour period. There simply aren't enough buses and airplanes in the area to make that process efficient. Our group was among the first to arrive, but we were also among the last to leave (by assignment, not by request). The need to move buses around rapidly meant that we ended up in the Detroit airport for about seven hours waiting for our flight. It wasn't all that bad. The airport is large, but it is more like a shopping mall than a traditional airport. They even had a stage with live music and a water feature that was intriguing to watch. There are plenty of places to shop and eat (at high prices you would expect in an airport). And there is a very nice tram that you can ride around the place. Our gate was in an area where international flights came and went. The thousands of people that passed by came in different shapes, sizes, colors. They came from diverse cultures and religions, spoke varied languages, dressed differently, etc. And yet as I sat there I had a spiritual experience, as I sensed the intense love God has for each one of these individuals. Our flight home was uneventful. It was rather late on a Saturday night when we finally collected our bags and headed home. Each of my boys managed to anger their mother by losing a nice Tupperware water bottle somewhere at MSU. Neither bottle ever showed up in the lost and found. NOAC was a grand experience. But it was grand mainly because I was with my kids. Without my own kids, I would have gone to the event if asked just to help other kids. That would not have happened this time around, given that there was a waiting list for others to go. I don't particularly like large gatherings and I could readily have gone happily on with life without having attended this event. But it was important to my two youngest sons. Watching their enjoyment of the event made it fulfilling for me. I had mixed emotions throughout the event. Scouting has played a big role in my life since I was about four years old when my mom first served as a Cub Scout den leader. I have been a member of the OA for 41 years. It was great to meet together with OA Scouters from all over the place. But overshadowing the whole thing was the recent row between the BSA and the LDS Church (see my 7/27 and 7/30 posts). The Church has played a bigger role in my life than Scouting and I wouldn't even be involved in Scouting were it not for the Church. Like other LDS Scouters, I'm waiting for the other shoe to drop — to get direction from church leaders and see where the path leads. Could this NOAC end up being my last major Scouting event? Maybe. Scouting is a great movement that accomplishes much good and is filled with good people. But it's far from perfect. Certainly the LDS Church has signaled that the BSA may now be too flawed for church purposes. The OA is imperfect too. For years people have questioned the Native American aspects of the OA. A handful of protesters occupied a street corner on the MSU campus one day during NOAC raising those questions once again. Another problem I see with the OA is lack of diversity. It's not that there are no minority members of the OA, but at each gathering of the entire NOAC, I looked across that sea of 15,000 Scouts and Scouters to see nearly all white people. I have nothing against white people, being one myself (with some distant Native American ancestry). But quite frankly, NOAC looked like a white boys club seasoned with a few token nonwhites. I don't know if NOAC attendees are closely representative of the broader OA membership. After all, it costs a chunk of change to attend NOAC, which likely eliminated a lot of people of all races, even if most boys were expected to help raise funds to defray conference expenses. But whether that expense level more heavily impacted nonwhite Scouts is anybody's guess. I'm just reporting what I observed. The next NOAC is scheduled for 2018 at Indiana University Bloomington. I fully expect attendance to drop off dramatically, given that it's not a landmark anniversary like 2015. Also, BSA and OA membership have dropped fairly briskly in recent years. If that trend continues, there will be a much smaller pool of potential attendees. At this point I'm not planning on attending NOAC in 2018. We'll see where events lead over the next three years. My boys and I were happy to sleep in our own beds after a week away, even though, the beds we slept in while away were comfortable enough. I'm glad that I accompanied my sons to NOAC. It was a once in a lifetime experience to do something like this with two of my sons. The way life runs, timing, finances, age ranges, and interests will likely never again align for something like that to occur. Regardless of what happens to my involvement with Scouting in the future, I will long cherish the week I spent with my boys at the 2015 NOAC.